Yucca desmetiana (picture right) is an interesting ‘soft leafed’ yucca with new green foliage that turns to an attractive burgundy red as it ages. This is a popular species for landscaping, they grow with a single stem and look good as a specimen plant. As they become established they will form a clump. The upright columnar habit makes it a great feature or accent for a rock garden or alternatively for growing in a pot or container. 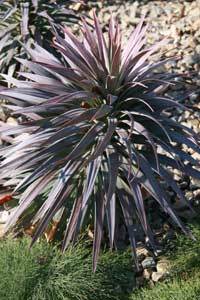 Grown as a foliage plant it is one of the best Yuccas in cultivation. Over time the plant will reach around 1 – 1.5 m in height. Suited to growing in containers or in the garden borderYucca desmetiana in an undemanding plant. Tidy up by gently pruning old spent foliage as required. Fertilise in spring using a slow release type fertiliser. Remove old dead foliage as required.